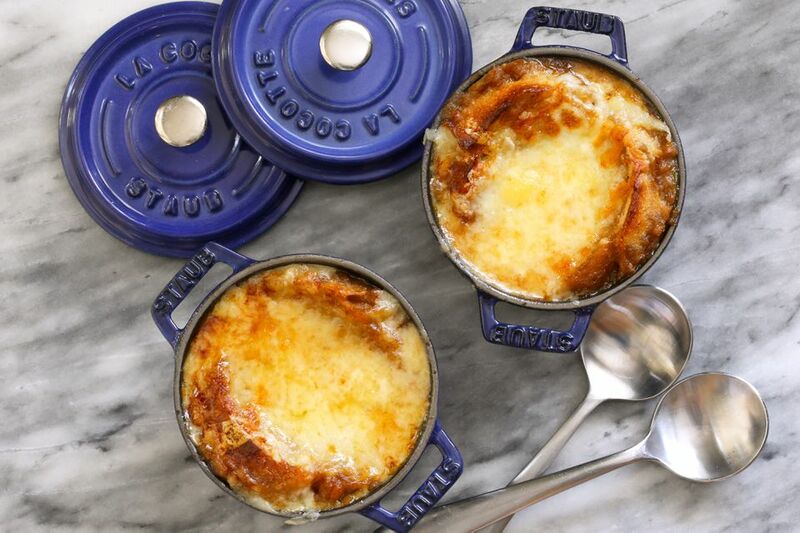 This Instant Pot French onion soup is assembled and finished in the oven with toasted French bread slices and a generous amount of Gruyère cheese. French onion soup is a comforting lunch or dinner soup. It's the perfect soup for a cold, snowy or rainy day, or serve it as a dinner party first course or appetizer. Using the Instant Pot, the onions are caramelized quickly and require very little hands-on attention. And if you have a food processor with a slicing disc, prep is a breeze. For the toasted bread topping, use either one large or two small slices to cover the entire top of the soup. A French baguette is ideal. Slice off the ends of the onions and then slice the onions in half lengthwise; peel them and cut into 1/4-inch slices. Slice the onions by hand or use a food processor with the slicing disc. Shred the Gruyére cheese and refrigerate it until you are ready to assemble the topping. Choose the sauté function on the Instant Pot and adjust it to the lowest setting. When the pot is hot, add the butter and swirl it around until it is melted and begins to bubble. Add the onions and baking soda and sauté, stirring frequently, until the onions soften and "sweat," or about 3 to 4 minutes. Add the garlic and cook for 1 minute longer. Cancel the sauté function. Add about 1/4 cup of the beef stock (or 2 tablespoons of sherry or red wine and 2 tablespoons of stock) to the onions and lock the lid in place. Turn the steam release valve to the sealing position. Choose the pressure cook or manual button, high pressure, and set the time for 18 minutes. When the time is up, carefully turn the steam release valve to venting to release the steam quickly. Choose the sauté function and continue to cook, stirring constantly, until much of the liquid has evaporated and the onions are deep golden brown. Add the salt, pepper, beef stock, Worcestershire sauce, the bay leaf, and thyme. Turn the sauté function to the highest setting and bring the soup to a boil. Turn the sauté function to the lowest setting and simmer for 10 minutes. Remove and discard the bay leaf and thyme sprigs. Taste the broth and adjust the seasonings. Preheat the broiler. Place oven-safe bowls on a baking sheet and fill them with soup. Place a slice or two of toasted bread on the soup and cover with a generous amount of the shredded Gruyére cheese. Broil the soup about 4 to 6 inches from the heating element until the cheese is melted and the bread is nicely browned around the edges. Garnish each serving with thyme leaves or chopped chives and enjoy! How to Toast Bread Slices: Heat the oven to 400 F. Arrange the baguette slices (about 3/4-inch thick slices) on a baking sheet. Brush the slices lightly with olive oil or melted butter. Bake for about 10 to 15 minutes, or until lightly browned and crisp. Gruyére cheese is a Swiss cheese that melts beautifully, making it an ideal (and authentic) choice for French onion soup. To substitute, try Emmental or Jarlsberg.